#1 Straight Arm Back-swing: As you feel the curved end of GOLFSTR+ lift off of the back of your arm you will know that your arm is bending. This is a reminder that you have reached the limit of your back-swing. A straight arm is preferred but a slight bend of the elbow is acceptable. Repeated use while playing 18 holes builds muscle memory for more consistent hits. #2 Flat Wrist Putting: Hinging your wrist in the putting stroke causes inconsistent control of the ball. For consistent, straight putting strokes you need to lock your leading wrist and let your shoulders and spine rotation create the swing. Practicing with GOLFSTR+ give you the confidence that every golfer needs your putting stroke. 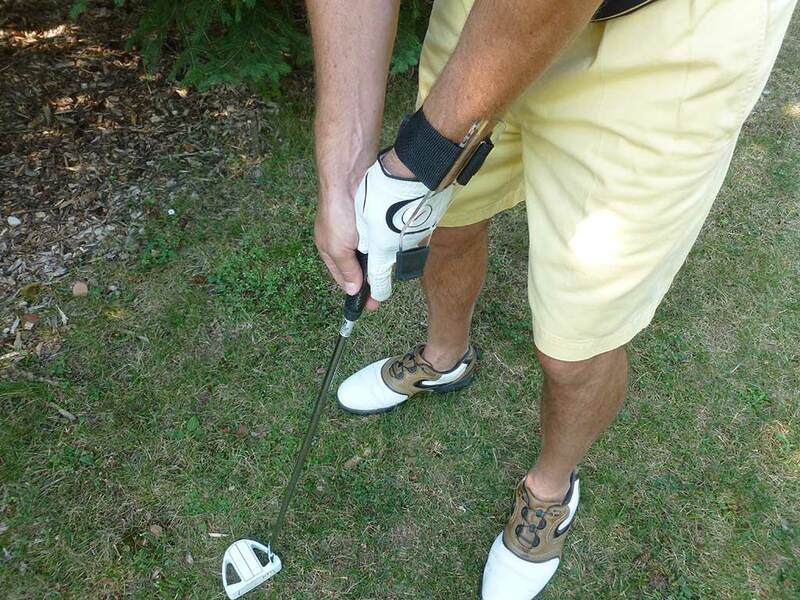 When practicing with or without GOLFSTR+, lock your hands together by extending your first finger (pointer finger) over the knuckles of the lower hand. #3 Flat Wrist Chipping: Cupping your leading wrist and scooping the ball at the point of impact create thin (short) mishits and fat sculled shots. 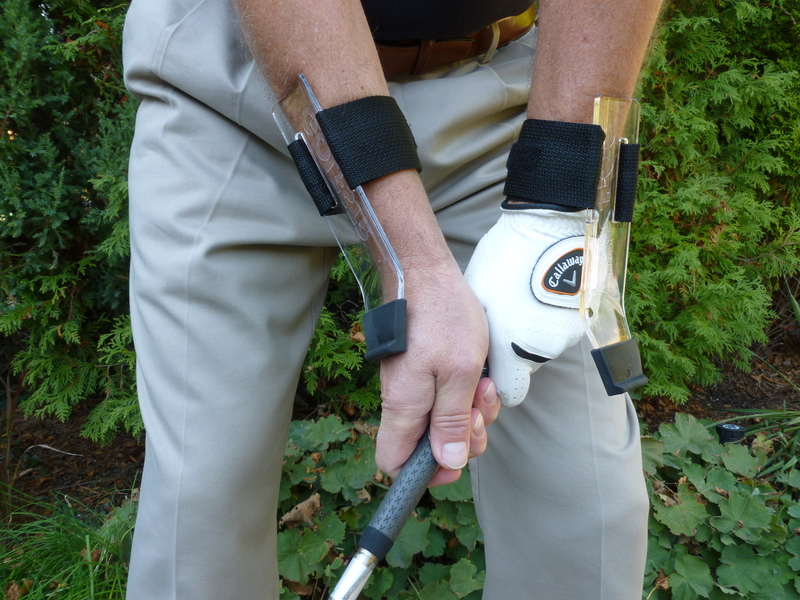 For chip shots your leading wrist can bow backwards slightly at the point of impact but never cup to allow the head of your club to flip ahead of your leading arm. GOLFSTR prevents you from cupping your wrist and gives you better directional control in your chip shots. #4 Flat Wrist Back-Swing: A cupped or bowed wrist on the gloved hand at the top of the back-swing causes inconsistent hits. For straight shots with controlled trajectory your gloved hand should remain in-line with the flat of your arm. A flat wrist keeps your club face square to the arc of the swing plane and makes it easier for you to square the club face at impact. We call this the “Takeaway Lag Trainer” because you need a wide takeaway with BOTH arms straight until your club is horizontal to the ground. This forces your chest to rotate. We learned this from Michael Breed on the Golf FIX show [Golf Channel] when he pointed this out as the reason for Adam Scott’s powerful drives. 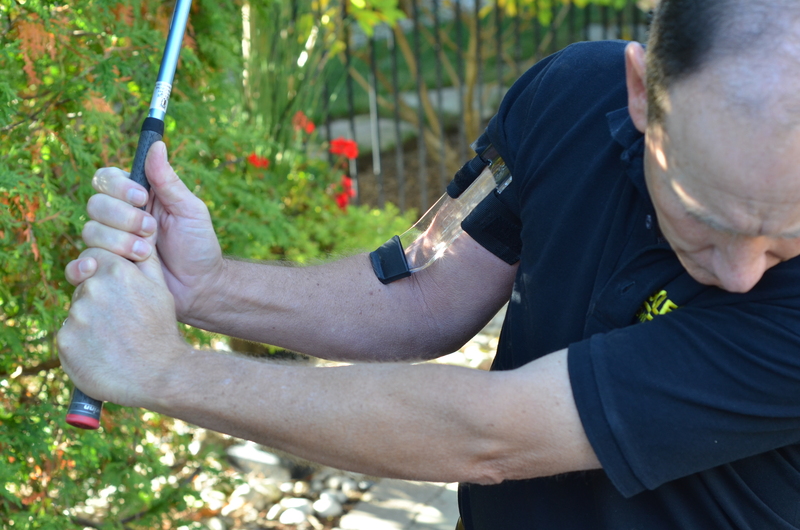 As your club continues to rise, bend your trailing elbow 90 degrees (to feel the rubber EXTENDER press on your lower arm as you pull your leading wrist to 90 degrees. Holding this lag angle at the start of your downswing gives you more power and distance in your hits. 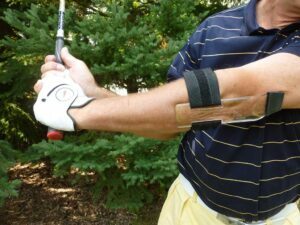 #6 Limited Wrist Lag Chipping: Swing Fix #3 is for chipping with GOLFSTR+ on your LEADING wrist to prevent cupping of the wrist in the follow-through. 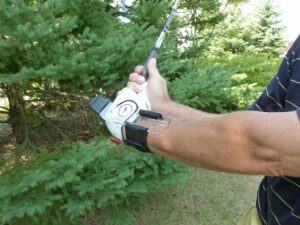 Another use when chipping is to place GOLFSTR+ on your trailing arm to allow wrist lag as you swing into contact with the ball. Allow the wrist to bend back at the same angle as the bent end of the plastic plate. Then follow through with a flat leading wrist. Leading with your hands will allow you to make a more consistent impact and also give you better directional control with your hit. Phil Mickelson calls it “hinge and hold”. 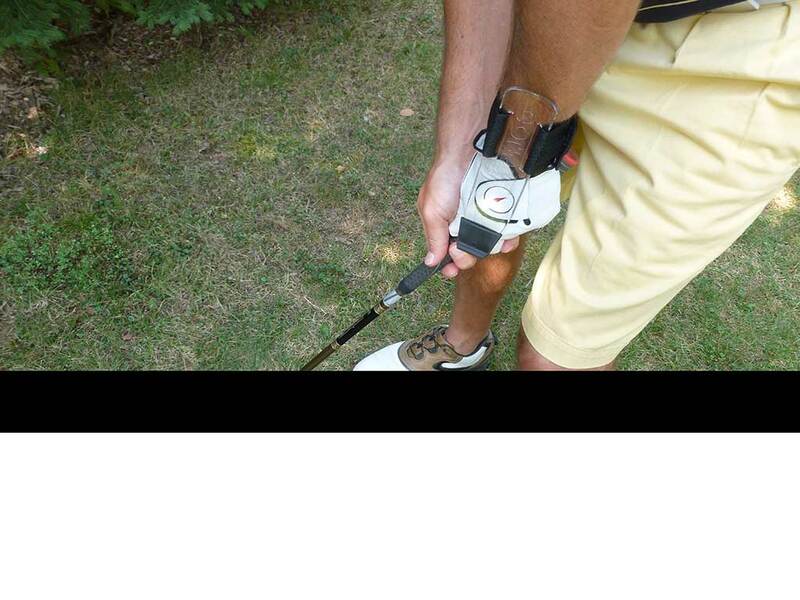 This photo shows the use of GOLFSTR+ on the leading wrist and also on the bent trailing wrist as the swing approaches impact. USER GUIDE: CLICK HERE to see the assembly instructions for each application.